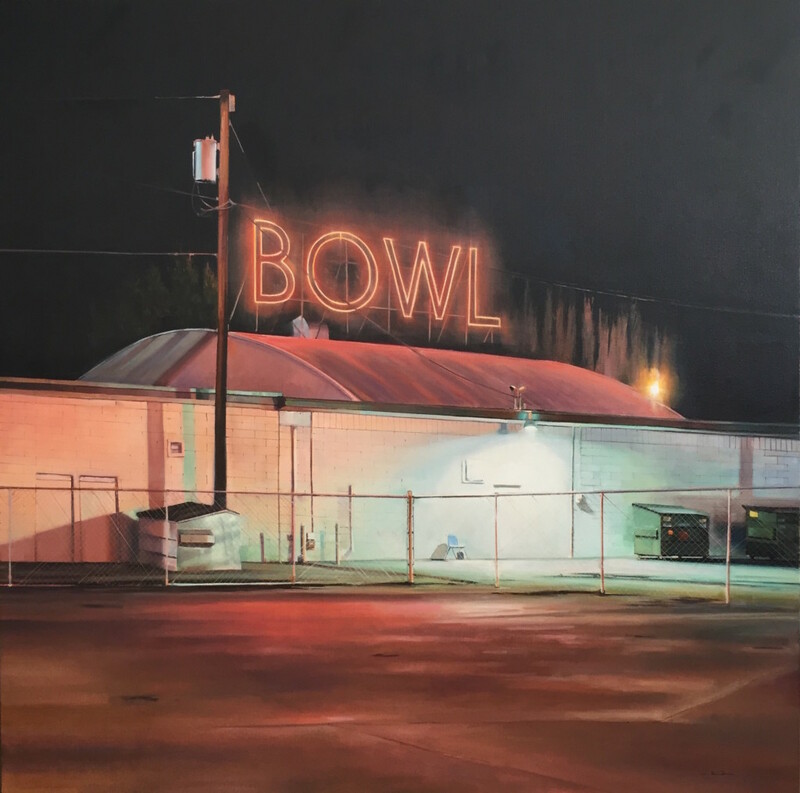 In his paintings James Randle achieves a sense of urban realism that reflects how the artist has absorbed the best lessons of some of America’s most meaningful masters of realism, including Edward Hopper, Richard Estes and Stephen Shore. Notel by James Randle. 48″ x 36″. Hopper’s paintings of diners, drug stores, drab rooms in hotels, gas stations and movie houses communicated the feelings of isolation, disappointment, frustration. 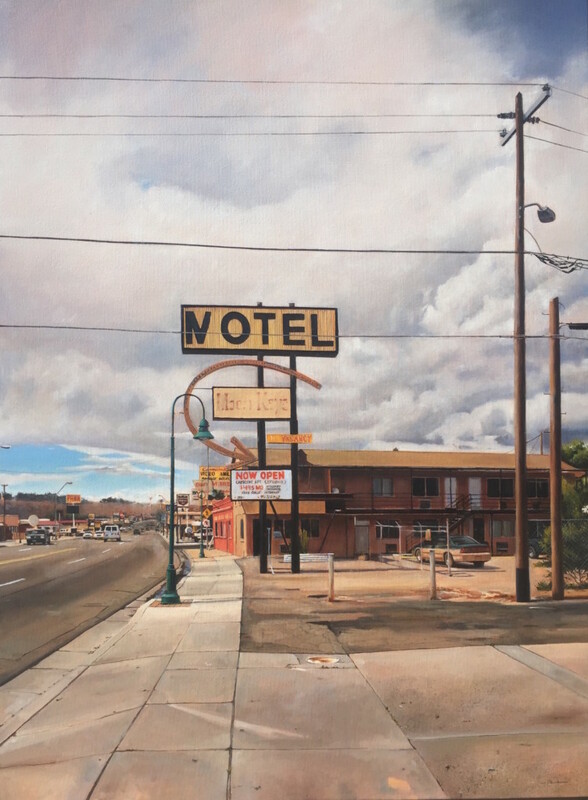 Estes created photorealist paintings from photographs of scenes of routine activity with ordinary, always anonymous, individuals. Likewise, Shore’s photographs of scenes in motel rooms or diner tables with plates of food on them or worn furniture suggested that these captured moments were part of a larger narrative of life. Randle’s paintings also appear to point to a bigger story, understood more satisfyingly as a personal meditation on a feeling or urge to connect but realizing just how difficult it is. Or, they remind how a locale that once was thriving and successful is now vulnerable to being eventually razed along with the memories of perhaps thousands of stories, the stage setting of various moments in people’s lives. Neighbors by James Randle. 12″x 16″. There is Notel, a rundown motel where part of the ‘M’ on the sign has fallen away, or Neighbors, depicting the driveways of two homes next to each other with vehicles but no sign of people, or Retirement Plan, showing a vintage Airstream camper parked out in an overgrown field. Randle (Booth 45), who is among the 174 artists in the Utah Arts Festival’s Artist Marketplace this year, points out in an interview with The Utah Review that, while he starts a painting from a photo he has taken of a particular scene, he avoids pure realism as he progresses on the work, because he wants to let the tone and feel to reflect his own response to the locales that he has either lived in or traveled. Retirement Plan by James Randle. 24″x 20″. 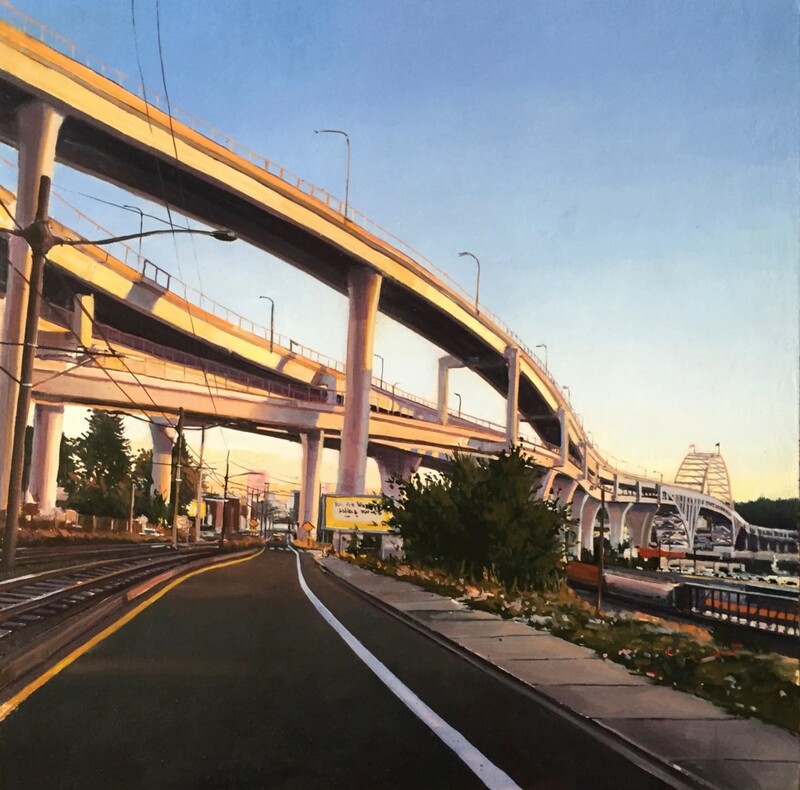 Thus, urban realism as Randle conceives it is not a caricature of the American imagination but instead a personal expression of how he sees the world. And, his paintings inevitably become more significant as locales change with the relentless advancement of commercial development. The works of urban realism become historical artifacts. 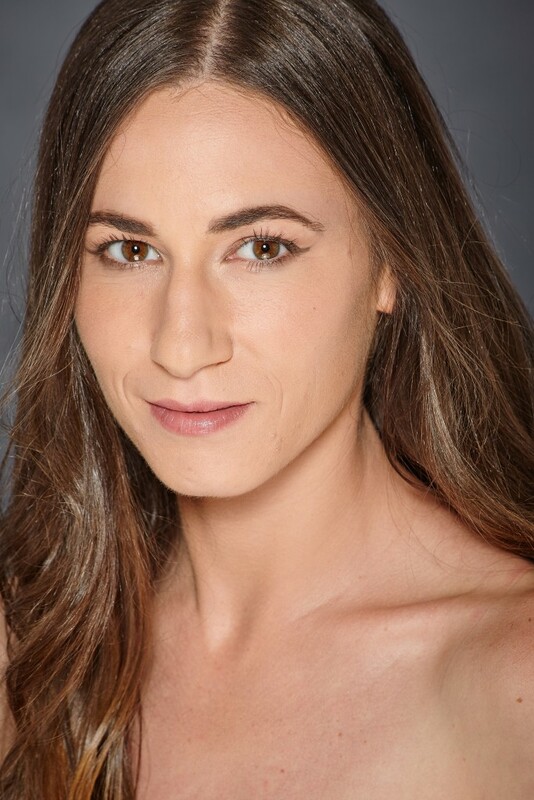 Randle, who has previously exhibited his work at the festival, is a 2005 University of Utah graduate with a bachelor of fine arts degree who has been living in Phoenix for the last six and a half years. His work has evolved from his earlier years, as his influences have expanded from earlier connections with the work of Andrew Wyeth and Winslow Homer to the underlying significance that has made the work Hopper, Estes and Shore endure precisely because it captures the nuances of human emotions and feelings even if a human figure is not represented in the painting. Power Bowl by James Randle. 36″x 36″. Randle’s father, Kirk, also a University of Utah graduate, took a different path. He is a highly regarded landscape painter known for his portrayals of country homesteads, impressionist landscapes, desert vistas and Native American subjects. 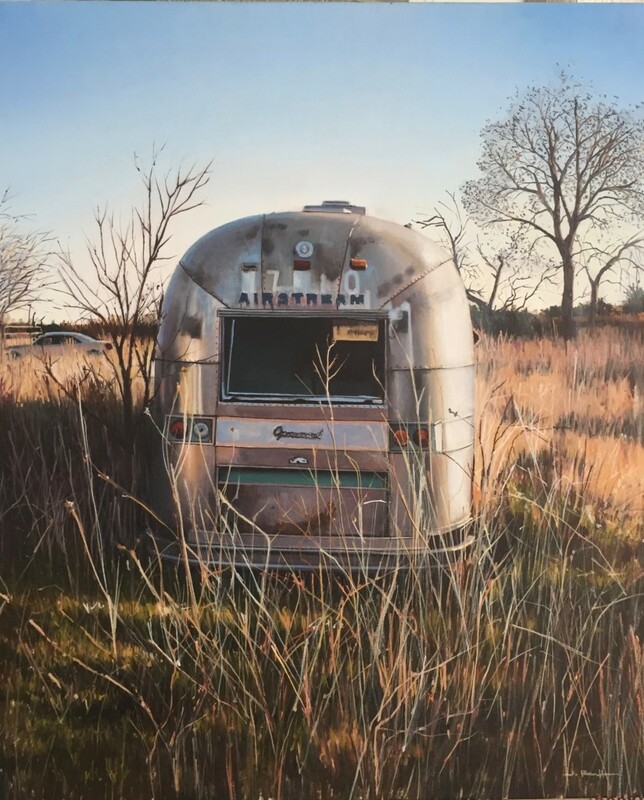 Randle has developed his work by focusing on the personal perspective he gains from expressing places and objects that may not appear to be interesting or beautiful for many at first observation. In his travels, he has collected many photos he has taken of various cityscapes in San Francisco and New York that stay clear of the iconic yet stereotyped and romanticized views. His images also include many roadside gas stations, dilapidated or rundown structures, and other elements suggesting routine stories or activities that he sees and stops to snap a picture because they immediately connect to him – or, as he describes, sparks a feeling of empathy. “I don’t schedule a photo so I let it happen naturally,” he explains. “One of the reasons I enjoy hitting the road for the arts festival is I have these opportunities to capture random shots.” Traveling to Paris and London, he was drawn to walls, vehicles, and other structures with graffiti, for example, and he observed the distinctions between American and European culture in the images he snapped. Orange Overpass by James Randle. 16″x 16″. Side streets often provide the ideas for some of his work. In Salt Lake City, two views that drew his attention were along Beck Street north of the downtown area and a photo taken during one of the worst winter inversion days on Edison Street in the vicinity of the old water tower that sits near the building housing the Salt Lake Film Society and the Broadway Cinema along 300 South (Broadway). 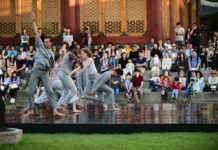 Randle has won several Best in Show honors in recent years, including the Utah Arts Festival in 2013, Park City Kimball Festival in 2015, and the Beverly Hills Arts Festival in 2016. 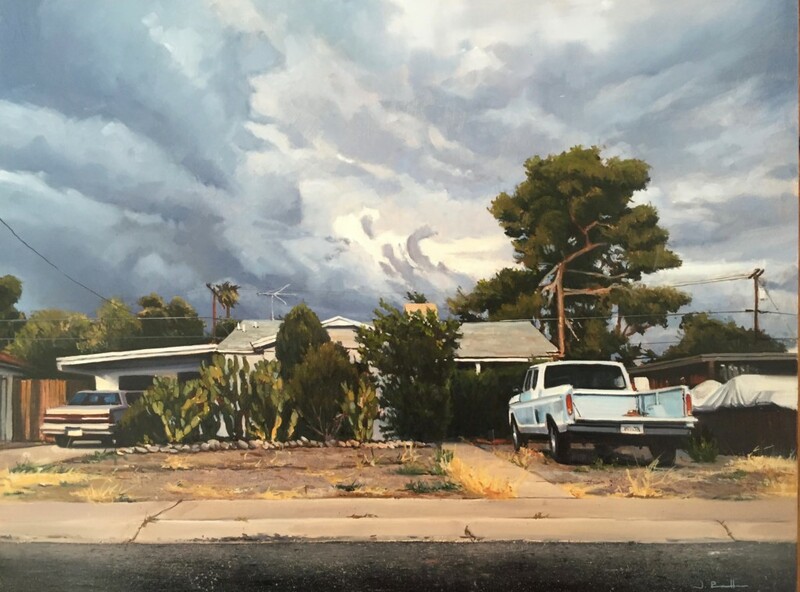 This year, he already has received an Award of Merit in Painting at the La Quinta Arts Festival.